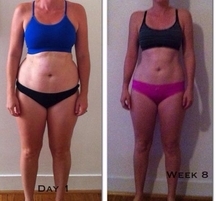 "For the first time in my life my body shape has actually changed, through following the Busy Mum Program I was able to not only get incredible results but find something that fitted around my busy life as a new Mum"
"I was addicted to diet coke, weight watchers lead me to believe it was healthy. This took away my focus on drinking water and nutrient dense food. What I loved about the Busy Mum Program was that I didn't have to count calories or have any point system. It was all about understanding foods and balancing it out to create a lifestyle approach"
I had got into some really bad habits after kids and just couldn't find a way out of them until I found the Busy Mum Program. The results speak for themselves and I am so extremely happy. I couldn't count how many diets I had been on in the past. For the first time this program worked and was a sustainable approach around my family life. After having two kids in such a short amount of time I didn't think it was possible to lose my "Mummy Tummy". Focusing on habits, rather then dieting I was able to get the results and a toned tummy again. The 8 Week Program was a game changer for me and the family. My husband also joined in and lost 8kg within the 8 weeks. It's something that we all good do which made it so much easier on me. mum can get the results they deserve. The Busy Mum program is more then just a weight loss program, it’s about creating inspiration, motivation to help you make a permanent lifestyle change for you and the family.